Packages to Fernando de Noronha and Fortaleza, Brazil . Fortaleza is a great beach destination to include on your Brazilian itinerary when visiting Fernando de Noronha. Get the tip from our local experts, learn about the package options to Noronha before you go. Capital city to one of the smallest states, Ceará, Fortaleza has everything a large city can offer, including beaches, an active nightlife, a variety of restaurants and plenty of shopping. Travelling in the city is easy thanks to its well planned layout and varied to suit everyone’s needs, including buses, taxis and car rentals. The Artisans Fair at Meireles Beach which is open only in the evenings, has hundreds of stalls, displaying handicrafts by local artists, many of whom work on creations at the stall itself, while the Central Handicraft Market is housed in a four storied building, where mementos from wood carvings and paintings to clay sculptures and t-shirts can easily be found.If you are looking for a souvenir, a visit to either of these locations will surely prove successful. 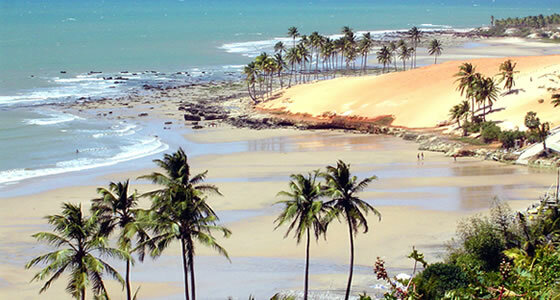 Each beach in Fortaleza caters to a particular interest. While Iracema beach is home to packed bars and restaurants, such as the famous Pirata nightclub, Estoril restaurant which serves regional cuisine and Gabrielle restaurant, well known for its pizzas, the 7 km(4,3 miles) long Futuro beach is most suitable for swimming, with its clean and safe waters and sunbathing. The Meireles beach stretch houses the city’s finest hotels and in the evenings is ideal for jogging, reading or watching a beautiful sunset before heading for dinner at one of its numerous restaurants. A stroll down the tiled walkway bordering Mucuripe, the southern most of the city’s beaches, will provide a view of “jangadas” or the local fishing boats. Finally, at the end of the walkway is the local fish market and “sorveterias”, serving delicious ice cream, including flavors of regional fruit. Those who want to explore quieter beaches can book adventure and off road trips to the less crowded beaches of Ceará outside the city. Fortaleza boasts of a host of restaurants offering authentic local as well as international cuisine, such as Colher de Pau and Mecuripe Grill for regional food, Milmar for seafood, Vignolli for pizzas and Kingyo for Japanese food. A visit to the various historical monuments such as the fortress of Nossa Senhora da Assunção and its museum, the Cathedral of Fortaleza and the Old Iracema Statue or the numerous museums, including the Museum of Folk Art & Culture or the Historical and Anthropological Museum provides an insight into the rich and varied Brazilian history and culture.